According to the South Korean news site Digital Daily, the upcoming Galaxy S6 will not be dust/waterproof. Samsung went out of its way to make the Galaxy S5 resistant to dust and water, giving it an International Protection Marking of 6/7. This means it’s fully protected against the ingress of dust and protected against the effects of immersion between 15cm and 1m. There’s no faster way to ruin your day than by dropping your smartphone in a puddle of water — something that far too many of us have experienced in our lives. Samsung acknowledged this issue, choosing to make all of its Galaxy S5 standard-edition units waterproof. If you accidentally expose your Galaxy S5 to dust or water, you can rest assured knowing that it’s protected. Many consumers have purchased the Galaxy S5 specifically for this reason. This begs the question: why isn’t Samsung using a similar IP6/7 certification in its upcoming Galaxy S6? Unfortunately, we don’t know the answer to this question. In fact, Samsung has yet to confirm the existence of a Galaxy S6, let alone provide a reason for its lack of dust/water-resistance. 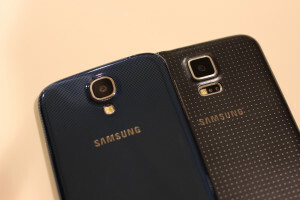 The Digital Daily reports, however, that Samsung plans to release at least two variants of its upcoming Galaxy S6: a standard edition, which is not waterproof, and an Active variant, which is waterproof. This wouldn’t be the first time Samsung released a non-waterproof standard and waterproof Active Galaxy variant. The Galaxy S4, for instance, was not waterproof, but the Galaxy S4 Active boasted similar IP6/7 dust and water-resistant specifications. To recap, rumors suggest that the upcoming Samsung Galaxy S6 will lack the dust and water-resistant shell casing of its predecessor. However, Samsung is reportedly planning to release a separate Galaxy S6 Active variant that is waterproof. So if you’re eyes are set on a waterproof smartphone, check out the Mobile World Congress event, because that’s when Samsung is likely to unveil its next generation Galaxy smartphones. Would you still buy the Samsung Galaxy S6 if it wasn’t waterproof? Let us know in the comments section below! ← Is The Samsung Galaxy S5 Still Worth Buying?